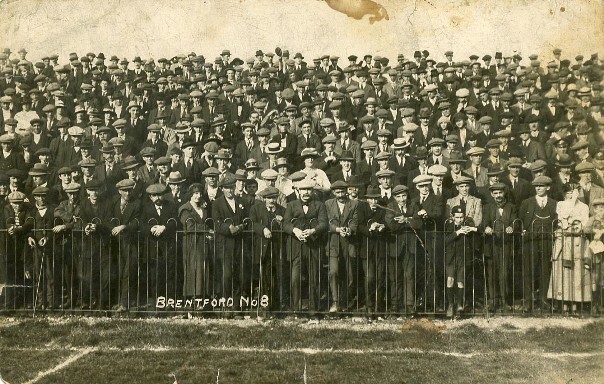 "I assume that its a crowd of Brentford Football Club fans at an away match. The photographer was George A Laver, of 2 Bensham Manor Road, Thornton Heath (stamped on postcard). In the 1911 census he's 23 years old and living at 7 Bensham Manor Road with his parents. I reckon that this is a little later than that. More women spectators than I'd imagine for a football match though. 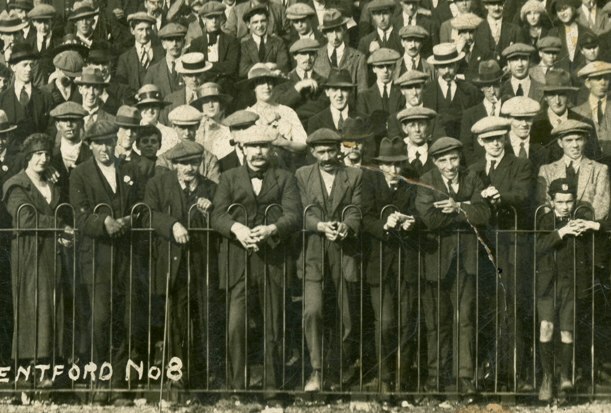 The mens' hats are interesting, more homburgs and almost trilby-like hats and fewer boaters so I guess this postcard to be 1915-1925 but that is a wild guess." Please get in touch if you recognise anyone, or know the location, or can suggest a date. Howard also sent a high resolution scan from which the second image is taken.